"Burn, burn yes you're gonna burn." - Zack de la Rocha. 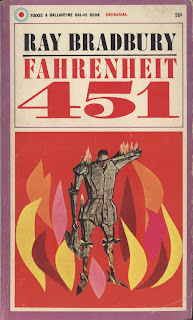 Fahrenheit 451 is a 1953 dystophian novel by the American author, Ray Bradbury. In this startling vision of the future, reading is forbidden and fireman start fires (as opposed to putting them out) and burn all reading material. The main protagonist, is a fireman named Guy Montag - a conflicted soul who starts to question the very nature of the fireman's job and reason for destroying books and the written word. He strikes up a friendship with a young woman called Clarisse McClellan, who also seems to question things rather than accepting them and harbours an interest in nature. Mildred is Montag's wife, a depressive, tv addict, trapped without a care in the shallow oppressive society that the bookless universe has become. Other characters include Beatty, the antagonistic and creepy fire-chief and Faber, a former English professor, plagued by regret and guilt for not defending books at the time motions were being made to ban them. There’s nothing like a good dystopian thriller to get the blood boiling, or should I say, books burning to a fragile, papery crisp. Fahrenheit 451 is the kind of book that leaves the taste of ashes in your mouth. The outlawing of books and the resulting acceptance by the majority of characters displayed in Bradbury’s tale is disturbing to say the least. Those that rebel against this the faceless government and the firemen are seen as the enemy – the social outcasts of a society dominated by fear. In fact, the government is shown to be the one that is plagued by fear – fear of the threat of books allowing independent thought in people – fear of questioning the totalitarian scheme that has been created – fear of the human race. Bradbury states that the book isn’t about censorship, but is rather an attack on television and how it destroys the interest in reading literature. In Bradbury’s world, television appears in the form of a Parlour – simply a wall onto which programmes are displayed constantly; possibly at the speed an inane quality they are now. The hero, Guy Montag – starts as a fireman, one who is conflicted and doubts his profession after meeting a like-minded and carefree soul in the form of Clarisse McClellan. After witnessing a woman self-immolate due to her love for books, Montag falls apart. This is where the story takes a drastic dive into the realms of even deeper fear and paranoia. Subtlety, you can see where these already lie – his wife attempts overdoses, yet doesn’t remember in the morning; the reveal that Montag has been hording books for months, possibly years – the tortured, alas poor villain of Beatty. There’s a futility that the Government has created here. There is now no excitement; there is simply just existing, sat in front of the Parlour and gradually degrading. The only thrill seems to be death – hence Mildred (Montag’s wife) supposed cries for attention; also Beatty, who it subtlety implies was a big reader and opposed to the government, but something turned him into a fireman and his parts in the book are the most interesting. He’s a mystery – a man so obviously tortured by what we can’t see (extensive library possibly?) that he suicides by cop in the second section of the book. You could argue that those who have accepted and succumbed to the Parlour and the oppressive regime are in fact, dead. Only those in support of books are alive. Montag being someone who was ‘reborn’ after his meeting with Clarisse; whereas Beatty comes across as someone who lost faith – who fell apart perhaps due to fear and sided with the government. Beatty’s actions as a fireman could be someway of repenting for his possible past love of books – his eventual death is him being finally free of a world that is so corrupted and consumed by fear.